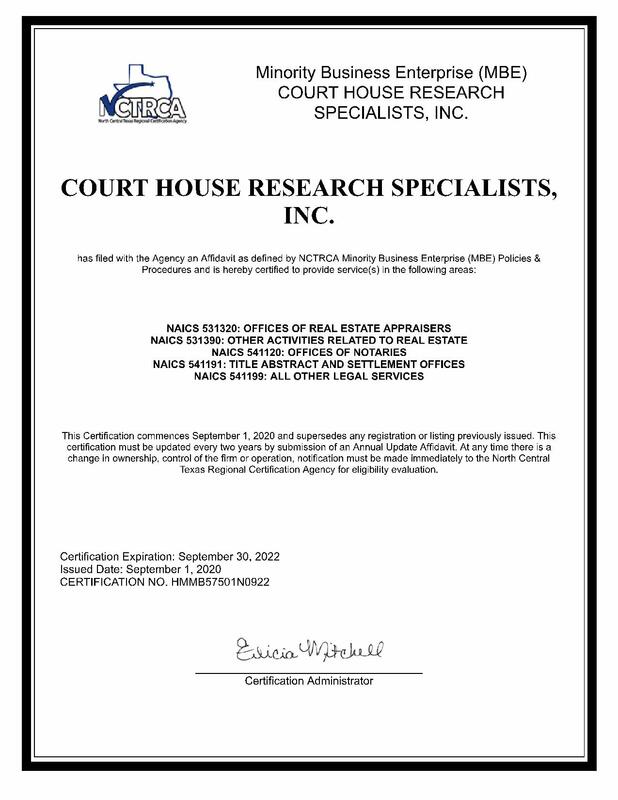 Courthouse Research Specialists, Inc. has over 25 years experience providing in-depth research of public records for ownership, easements, liens, encumbrances or other related searches. Additionally, the copy and retrieval service of the company obtains copies of documents and court cases statewide when needed. 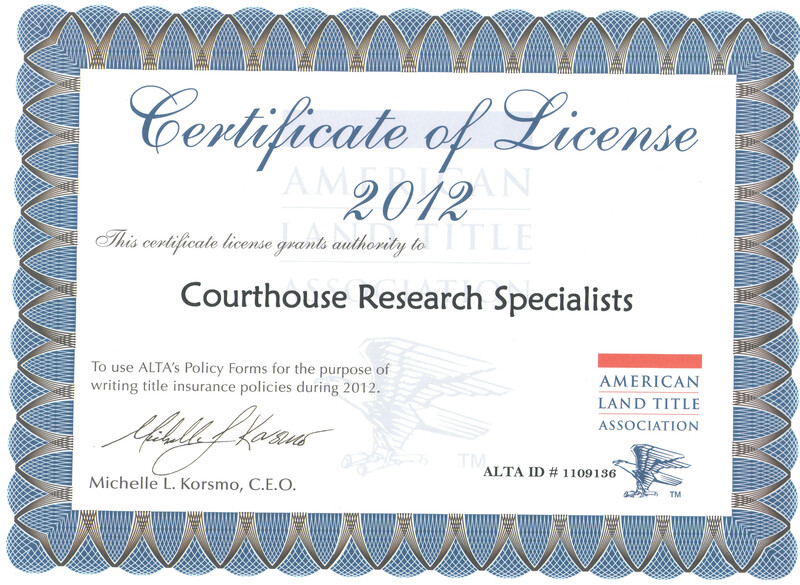 Courthouse Research Specialists, Inc. is one of Texas leading provider of land record business information. Courthouse Research Specialists, Inc. is committed to providing the information resources your business needs to make timely and accurate decisions. Backed by integrity and experience, we deliver efficiency to support your business information needs. Projects range from “determining single ownership of a property” to “title research for pipelines, highways and specialized easements". Richard Ortiz is CEO of the company. A former North Texas Chapter Area Representative at the State Level for Texas Society of Professional Land Surveyors (TSPS). A two year Director for TSPS Chapter 5. Over 25 years experience in title research. Richard has diverse professional experience in all aspects of Real Estate Title. He oversees all functions of the company, customer service, and client satisfaction. Gustavo Valladolid is a Senior Abstractor / Professional Petroleum Landman. He provides research services including examining title from present ownership back to patent records. Abstract mineral reservations and provide detailed property reports, including; Deed records, liens, judgments, probate and Civil and District Court records. Colleen Hanchey is a Professional Petroleum Landman provides research services including examining title from present ownership back to patent records. Abstract mineral reservations and provide detailed property reports, including; deed records, liens, judgments, probate and civil and district court records. Mike Reddell is a Senior Abstractor / Professional Petroleum Landman. He provides research services including examining title from present ownership back to patent records. Abstract mineral reservations and provide detailed property reports, including; Deed records, liens, judgments, probate and Civil and District Court records. Jerry Darden is the Public Utility Research Specialists. He has 35 years Utility Research experience. He is the leading authority on records contained in the City of Dallas Surveyor’s Vault. He acts as our liaison with Planning Development Departments and other municipal entities related to real estate. Jerry functions as Project Lead on all Tax Certificate Research and retrieval. Terry Pratt is a Professional Petroleum Landman. He provides research services including examining title from present ownership back to patent records. Abstract mineral reservations and provide detailed property reports, including; Deed records, liens, judgments, probate and Civil and District Court records. He is a Licensed Right of Way Acquisition Agent. Please visit our Land Rights (ROW) Appraisals & Acquisitions Services page for more information.